An abstract experiment. I was making some oil paint today using terre verte pigment (PG23) from Sennelier and I liked the way it spread on the grinding plate. That’s a little more than half a tube worth of paint. Of course, after taking the photo I scraped it all up to put it in a tube. 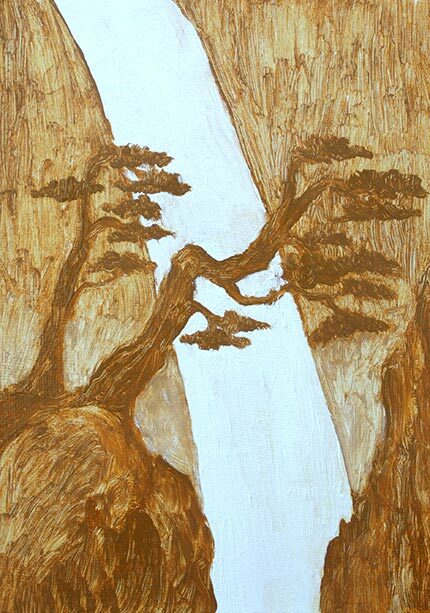 This painting is loosely based on a Chinese landscape painting I saw in a book of mine called The Jade Studio. It’s a very good book, but I don’t have it with me right now so I can’t look up any information on this painting or the others except what I had already typed. I only used mars yellow that I made myself and titanium white from M Graham. I finally decided to try making some oil paint a couple of weeks ago with the glass muller I had gotten from Natural Pigments. So far I’ve only used it for making watercolor because I thought the cleanup after using it for oil paint would be a bit of a hassle… and it kind of was. I think the result I got was worth it though. I used mars yellow (PY42) pigment from Blue Ridge and walnut oil from M Graham. The finished paint was very soft and kind of goopy and ropey, which I like. The only problem was that I made way too much of it. I made alla prima painting after painting with nothing but mars yellow, and sometimes white, trying to use up as much as I could. 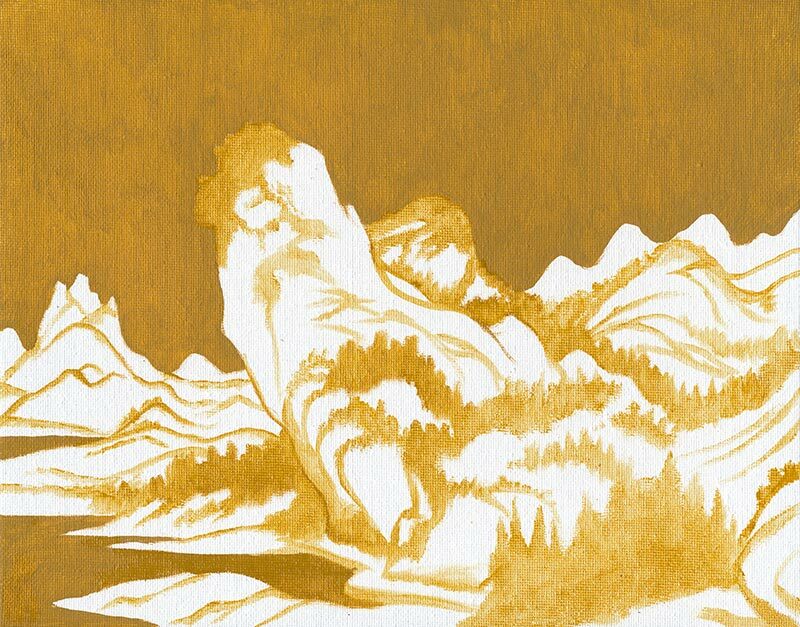 This is a copy of a painting from a series of paintings by Dai Xi (1801-1860). 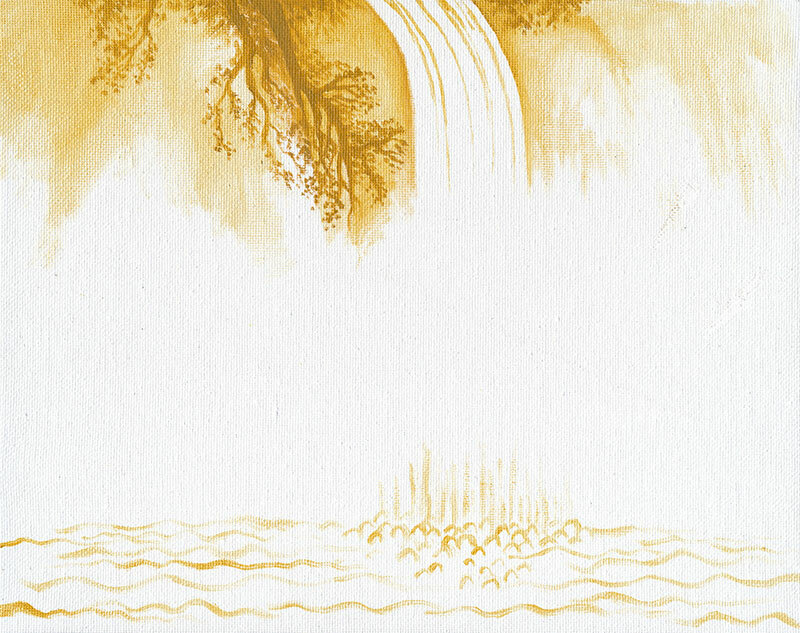 I think it’s leaf 8 of the first album from his “Double Album of Landscapes” if I’m understanding this book right, but I don’t have the title for this exact painting. I can’t seem to find this painting online to show what the original looks like. In my version I only used mars yellow. There’s no white paint or any other paint. In the lighter areas I thinned the paint a little (or a lot) using Gamblin’s Neo Megilp, which I recently got and wanted to try out, and the white areas are completely blank canvas. This was kind of an experiment because I don’t think I’ve left parts of a canvas blank before, but it can be done in watercolor so I tried it with oil paint. Another copy of a painting that I don’t know the name of from that book. It was a winter scene with a lot of snow and grey skies. This one also has blank canvas for white and thinned paint in the lighter areas. The original had some buildings too but I left them out. I think this is the only one I didn’t paint in one sitting, but I also didn’t paint over anything either so it might as well have been painted all at once. This isn’t based on another other painting, but I wanted to experiment with it. I already had a small canvas that I had covered in several coats of white acrylic paint to smooth out the canvas texture. 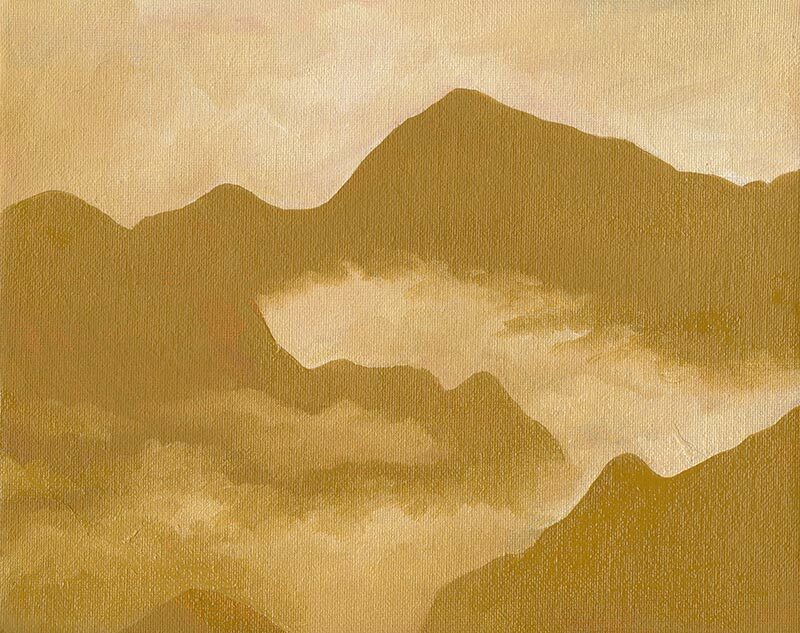 I was planning on making a completely different painting on this, but I wanted to try this paint to see what kinds of brushstroke textures I could get on the smooth surface. I think it worked out well, except that for some reason even though the paint wasn’t very thick it took a long time to dry. I would have posted all of these a week ago if this had been dry but even still it’s too sticky to set on my scanner. I took a photo instead, in early evening shade, which is why the colors look different. PR101 and PR102 (Pigment Red 101 and 102) are among my favorite pigments for paint and they come in a large variety of colors. PR102 is a natural red iron oxide (red ochre) and PR101 is the synthetic version. Below is my collection of oil paints using either of these as a single pigment paint with nothing else added. I photographed this in direct sunlight during the afternoon. All of the paints were mixed twice with about an equal 50/50 mix with white. This is my only natural red ochre in oil paint. As I understand it this pigment is made by roasting natural yellow ochre pigment until it turns reddish. It could make a good alternative to burnt sienna. It’s a little lighter and brighter, and has a stronger color. I wasn’t really sure what to expect when I got this because the name sounds like it’d be what’s normally called Transparent Red Oxide, which is the variety of PR101 that W&N already uses in their “Burnt Sienna”, but this is really very different. I think it’s close to the same as the Yellow Ochre Burnt above it but this is a slightly cleaner and more pure color. As the name suggests, this paint is semi transparent. The tinting strength isn’t as overpowering as some of the others in this list so it’s a bit easier to work with. This is one of those paints that I wish I had gotten years ago. It might even be my favorite red ochre. 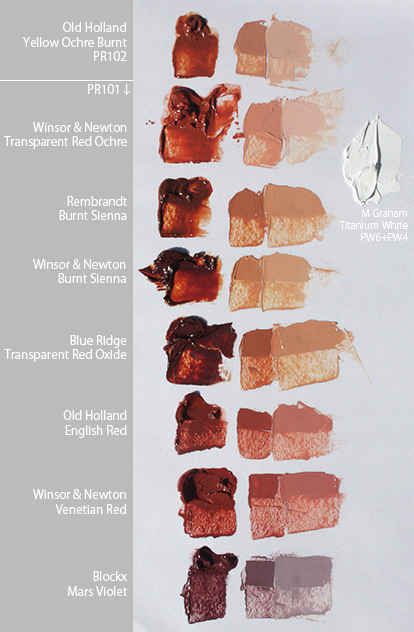 Although real Burnt Sienna is made from either PBr6 or PBr7, there are a few brands of paint that use a Transparent Red Oxide version of PR101 instead, which has a much stronger color, higher transparency, and higher tinting strength than actual burnt sienna. It doesn’t show up well in the photo but this particular one is lighter in masstone than the “burnt sienna” below it from W&N. A nice example of Transparent Red Oxide. It has good transparency. I tend to prefer paints like this over actual burnt sienna for the greater color strength. Very similar to the above paint, but not as transparent. This one also seems to have a slightly higher tinting strength, but I can’t guarantee that I got the mix with white an exact 50/50 mix on any of these. Now we’re getting into the slightly cooler temperature colors for red ochres. This is a very high tinting strength paint, and easily overpowers most other paints that I mix it with unless I use extremely small amounts of this. Because of that, I don’t think I’ll ever run out of this one when you consider how little of it is needed in each paint mix. This one it so similar to the venetian red below that I actually mixed up the labels on the image at first. I’m 99% sure I have it right now since I kept the tubes lined up in the same order that I placed the paint on the palette and because this paint has a thicker, more viscous consistency. There’s a little bit of variety of colors that are referred to by different brands as “venetian red” but this name is generally given to a semi-cool earth red that’s not as cool as something like an Indian Red. As far as I know this is about as cool as red ochres can get. I bought this one from Blockx because when I looked at a paint chart someone else had made of different brands of mars violet the one from Blockx looked like the coolest. 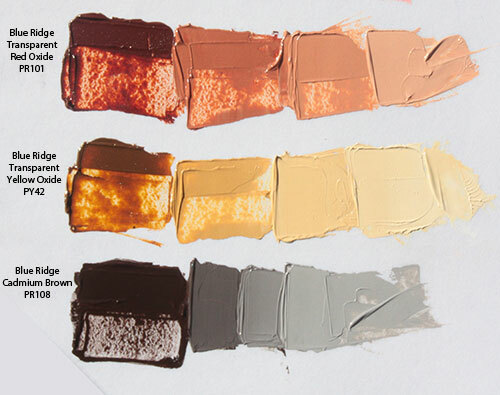 On an earth palette of red and yellow ochres this could be a very useful. 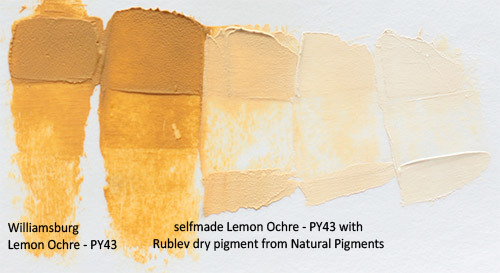 A similar comparison of yellow ochre oil paints can be found here. It’s been awhile since I’ve done this, but over the past few months I’ve gotten various new paints from several brands in both oil and watercolor and I thought I’d make some swatches with them over the next few days. This time I have the 1 ochre and 4 black oil paints I got from Williamsburg over the summer. Each swatch was first spread from a small blob of paint and then mixed in a roughly even mix with M Graham titanium white (PW6 + PW4). I’m pretty sure that’s the white I used. It was actually yesterday that I did these. That mix was then spread to the right of the original paint. A small amount of that was mixed again with an equal amount of white, and then again once more, for a range of increasingly lighter swatches that show the tinting strength of the paint. All of these photos were taken today in the afternoon during overcast clouds. I can’t guarantee perfect color accuracy. German Earth (PBk11) is natural black iron oxide. As expected of this pigment, it’s an opaque paint and a strong tinter. Williamsburg’s website describes it as “bluish” when mixed with white, but I’m really not seeing it. I’d say it’s fairly close to neutral. Slate Black (PBk19) is actually very similar to German Earth, but less opaque. It’s apparently made from slate from Pennsylvania. Just a little bit gritty. Davy’s Gray Deep (PBk19) is also slate from Pennsylvania but much lighter and with a warmer color. It’s very smooth and spreads surprisingly thin. I think it’d be very good at glazing. The photo doesn’t show it the best, but this was lighter than the first two in masstone. Its tinting strength is pretty low. Apparently slate comes in several colors, and as far as I can tell Williamsburg might be the only paint company that currently makes oil paint with slate. Many other brands all produce a “Davy’s Gray” of their own that is always one of various mixtures of pigments. A very unique paint. 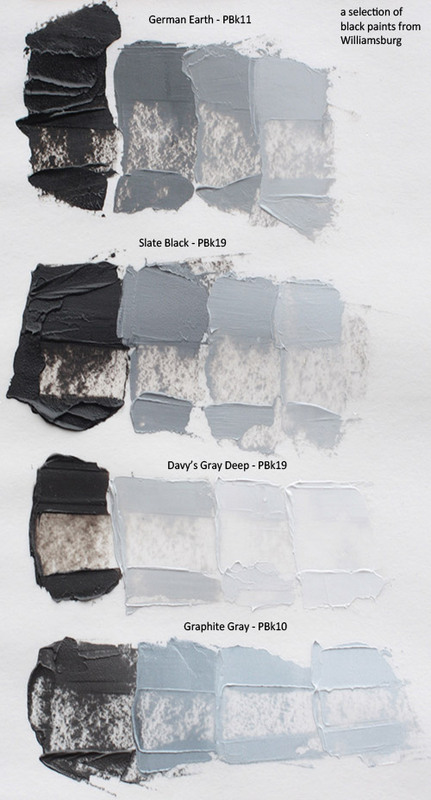 Graphite Gray (PBk10) is made from ground graphite. It’s another unique paint that I’m glad I got. I think it looks a little lighter here than it really is because of how the light was reflecting off the paint, but this is the lightest of the four. It’s just slightly iridescent because of the graphite. I really like this one because it’s easily the bluest black paint I have. This Lemon Ochre (PY43) is another natural iron oxide and is part of the Native Italian Earths set. I only have this one from the set. It’s a very strong earthy yellow. I really like the color a lot. Kind of gritty though. As you can see in this closeup the vertical streaks are where tiny particles of grit were dragged along under my palette knife as I spread the paint thin. 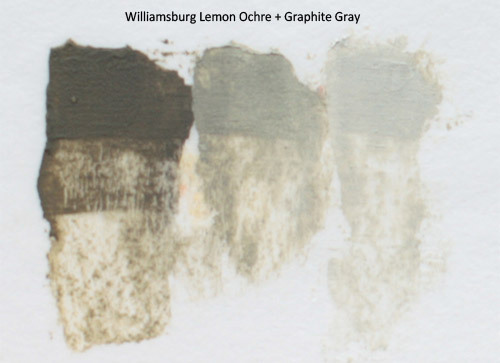 I had heard that Williamsburg’s earth pigments tended to be gritty, and at it seems least a couple of them are. While I can’t say this is a positive thing, it’s not necessarily a big deal. I mostly notice the grit in any paint from any brand, if it has any, while spreading and mixing it on my palette with a palette knife. When I’m actually brushing the paint onto a canvas I don’t really notice as much because of the different tool and surface texture. Since I recently got some dry pigments from Natural Pigments and one of them was their version of Lemon Ochre I thought I’d make some paint myself and see how it compared. 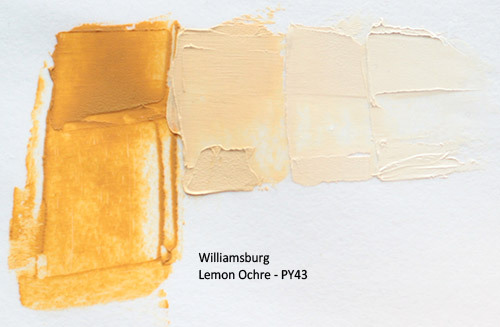 The color between the two was nearly the same, although the Williamsburg paint on the left was slightly lighter. The paint I made had a little bit higher tinting strength but I don’t have enough experience with making my own paint to know what the best proportions of oil to pigment are and I may have used too much pigment. The paint I made had a tiny bit of grit too, but noticeably much less. Here I made an earthy green with a mix of Lemon Ochre and Graphite Gray. I really like the subtleness of it. A very natural looking green. Just to show it, here’s what’s left of the white in the corner of my palette. Each time I get another dab of white I thoroughly wipe off my palette knife first so it doesn’t get the white messy. Overall I really like all of these paints. My collection of black paint still doesn’t quite have all of the black pigments out there, but I’m now a lot closer to it. I posted this on an art forum a little earlier in response to a thread asking if the long held belief that zinc white causing mixes to be “cooler” (i.e. bluer) than when using titanium white is correct. Titanium white (PW6) is much stronger so it only takes a small amount to have a big effect on the paint you’re tinting with it. It’s more opaque and is often times said by artists (from what I’ve seen especially by those who prefer lead white, such as PW1) to make tints seem “chalky” or dull. In this comparison I’m also trying to see if this is the case. 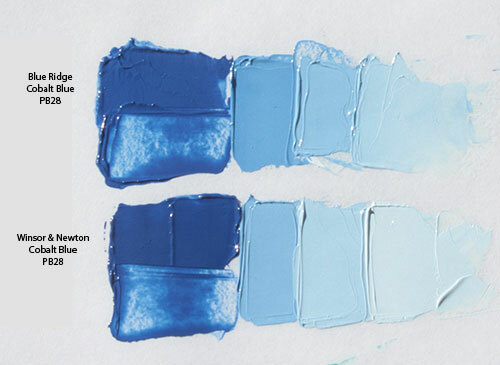 Zinc white (PW4) is more transparent and much weaker when it comes to lightening other paints in tints, so you’ll need more of it to have the same effect. 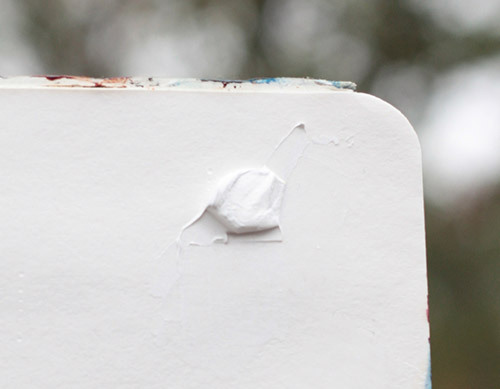 For this reason it’s sometimes called mixing white, because you can more easily make small adjustments to a paint’s lightness without accidentally making it too light. It’s also said to become hard and brittle if allowed to dry on a canvas by itself and not mixed into anything else. This was photographed yesterday in late afternoon outdoor sunlight. The image should be mostly self explanatory. I mixed each row to be about the same value (amount of lightness/darkness), and it did take far more of the zinc white to get the same result. The color samples were averaged in Photoshop over a 31x31px area of each swatch and the results are shown in Lab color space. As you can see, the “cooling” effect of zinc white was minimal, being only noticeable by a small amount in the middle and dark values of grey. I chose charcoal black because it’s close to being neutral black, so I thought if anything would show a slight blue shift then that would be it. The blue showed almost no difference between the two in the photo, although in real life I can see a slight difference with the lighter value being a little duller on the titanium side. The red was easily the biggest difference, with the lighter value being very noticeably duller on the titanium side. Interestingly, the green/red results had almost no difference but blue/yellow did. It appears people who say titanium white makes chalky tints actually may have a point, as it definitely affected the red. This photo was taken the next day in about the same lighting as the previous one. I thought there’d be a difference in the greens or yellow, but they’re almost 100% exactly the same. I got most rows to be nearly the same value, except the last couple on blue. This time some samples were averaged from 11×11 squares because small ridges of paint across a few samples that might throw off the accuracy. 1. The idea that zinc white “cools” colors in mixes doesn’t seem entirely true, at least not with this tube. 2. The idea that titanium white produces “chalky” tints also seems to be false, given that most of the tints from both tests are nearly the exact same whether it was made with titanium or zinc. Maybe the people who say it’s chalky are comparing it to a lead white, but I avoid lead paint and can’t do a proper comparison with it. 3. Either of the above conclusions may have specific exceptions, and those alone may be the origin of these ideas. 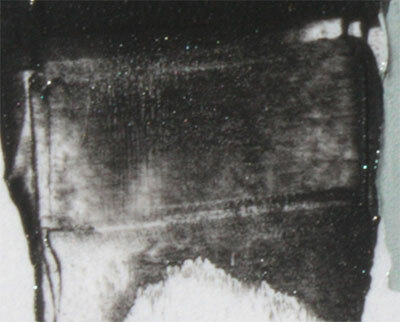 The lightest cadmium vermilion tint was much duller with the titanium than zinc, and the charcoal black did show a small shift toward blue with zinc. My camera itself and the lighting may also have played a role. Even so, from what I’m seeing here it seems that there is in most cases no more than a minuscule difference between zinc and titanium whites when both mixes have been mixed to the same value, and many cases where there is no visible difference. 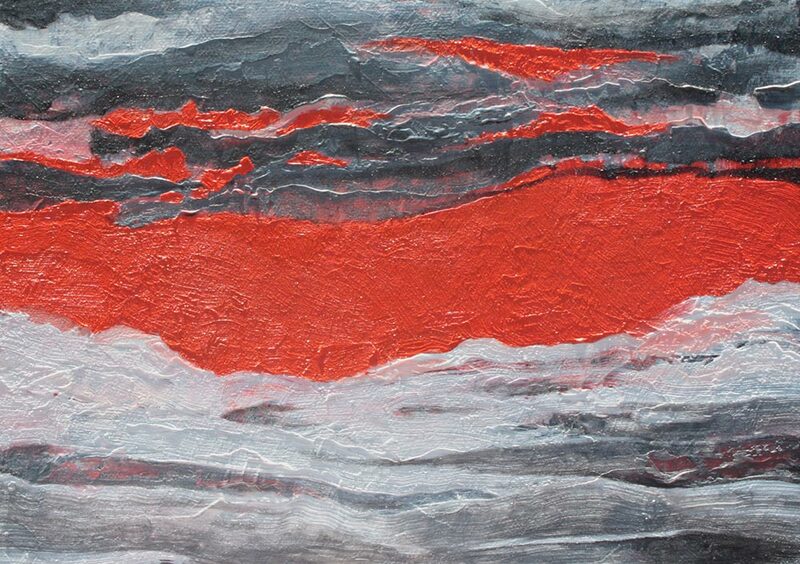 This landscape is based on myrickite, a stone mined near here that has streaks of natural cinnabar (vermilion). I made this partly with paint I made myself (mars black and titanium white) and partly with paint from Blue Ridge (charcoal black and cadmium vermilion). Update: In September of 2015 there was a fire at Blue Ridge that put a stop to making new paint for a long time, but in February of 2016 they’ve started taking orders again. However, the selection is much smaller than what it was and some of the paints below may not be available. They’ve said that eventually more paints will be added to their lineup. Also, the prices quoted below may be out of date now. A couple of weeks ago I received my first order of paint from a still young brand that’s new to me, Blue Ridge, and I’ve been practicing with them since then so I can do this review. Blue Ridge is a small company (i.e. one man, Eric Silver, owns the company and makes all the paint) that’s located in North Carolina. You can watch a short video interview with him on youtube here. All of these photos were taken in full outdoor sunlight, and I can’t guarantee perfect color accuracy. Most of these paints I chose because I didn’t already have one of them from any brand, so I won’t be able to do many direct comparisons. The Winsor & Newton paint that I am comparing a few of these against was gotten probably around 10 years ago and from what I’ve read their quality has improved (I don’t know by how much) as of a few years ago, so I can’t guarantee the same comparison results with current production paint, however I do have high regard for the quality of Winsor & Newton. The white that I used to mix the tints of each paint sample is Charvin titanium white (PW6). Each tint is made by taking a small amount of the previous swatch and adding roughly equal amount of white to it. So the first tint is a 1:1 mix of the original paint swatch with white, the second is a 1:3 mix, and the third is 1:7. I can’t guarantee I got the mixes exactly equal, but it’s close. Finally, note that this isn’t exactly a scientific review and is largely my own opinions and observations from first hand experience. First I’ll go over each individual paint and then my thoughts on the brand as a whole. All of the paint I tried had very similar, and very good, handling. Not too thick or too thin, and were pleasurable to work with. They seemed to have a semi-matte finish when dry, which might be something to keep in mind if you’re going to use them on the same painting as another brand that’s glossier. First is cadmium lemon, which is very bright and sunny. Actually much brighter than I expected based on the swatch of it on Blue Ridge’s website. I’ve found it to mix very good greens. I’m currently glazing (with a little liquin added) it over cerulean blue in a painting I’m working on and the greens I’m getting are especially good. I’ve compared it next to Winsor & Newton’s cadmium yellow pale, which is warmer but the closest paint I had to this, and hue differences aside I found the tinting strength to be pretty much the exact same. Blue Ridge’s cadmium yellow’s are all currently $19 for 40ml, while according to dickblick.com Winsor & Newton’s cadmiums all currently retail for $35.49 for 37ml, though you can mail order Winsor & Newton’s cadmiums from various catalogs for around $19ish as well. A long time ago there was a pigment called indian yellow which was made from the urine of cows that had been fed mango leaves. There’s a little more to the process than that, but yeah nobody I know of does this anymore. This means modern “indian yellows” are made with various pigments and mixes that different brands feel mimic the warm orangish yellow of that historic pigment, and because of this there does tend to be some variation between brands. 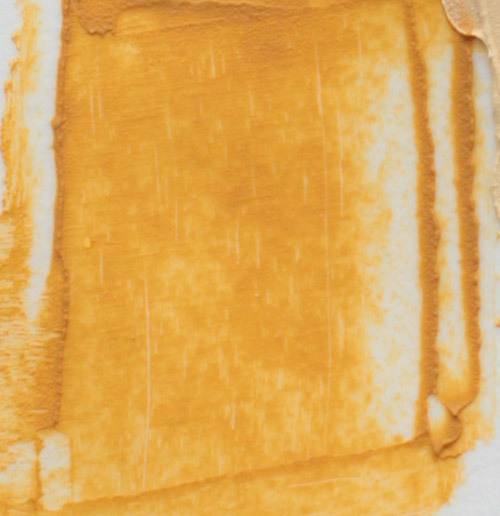 This particular one is a very warm and attractive orange and is made with a reliable pigment, PY110, the same one that M Graham uses in their indian yellow in oil, watercolor, and acrylic paints. I think the first tint is similar to the color of some pumpkins. The cadmium vermilion was one of my favorites of all the paints I tried from Blue Ridge. Very bright, intense, slightly orangish red. So much so that my camera had a hard time really capturing the color, and I see the same in the color swatches on Blue Ridge’s website. The red from Winsor & Newton that I’m comparing it with was a little more pinkish in tints than this photo shows, but their tinting strength was similar. The cadmium reds from Blue Ridge are slightly more than their yellows at $21 each. The transparent red and yellow oxides are another paint that I just never got around to getting in oils until now. To me, these two should go together as a pair, and fit very well in an earth palette. I especially liked the yellow in its tints. Cadmium brown is an oddity, since I only know of one other brand that carries it and until recently had never heard of it. I emailed Eric about this one and he said it is indeed a cadmium red pigment, PR108, but is apparently made a little different to get this very deep brown. He also said this is lightfast but isn’t made anymore, and he just has old stock left, so if you’re interested in it I’d suggest getting it sooner rather than later. I like the interesting greys it produces in tints. It’s cheap too, only $9. Cobalt blue is my own favorite blue, so it’s the only paint from Blue Ridge I got that I already had a matching tube of in another brand. Blue Ridge’s version is slightly lighter straight from the tube and appears higher chroma to me. I was very pleased to see it also has higher tinting strength than Winsor & Newton’s version, which is really saying something when you consider than their version was the darker of the two at the start and yet was lighter by the very first tint. 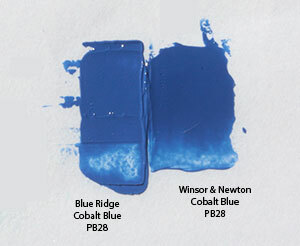 Winsor & Newton’s blue is the same price as their cadmiums, while Blue Ridge’s is $21. Here’s a closer look and as you can see Blue Ridge’s paint is definitely lighter and slightly stronger. Between the two, I prefer what I’m seeing from Blue Ridge. 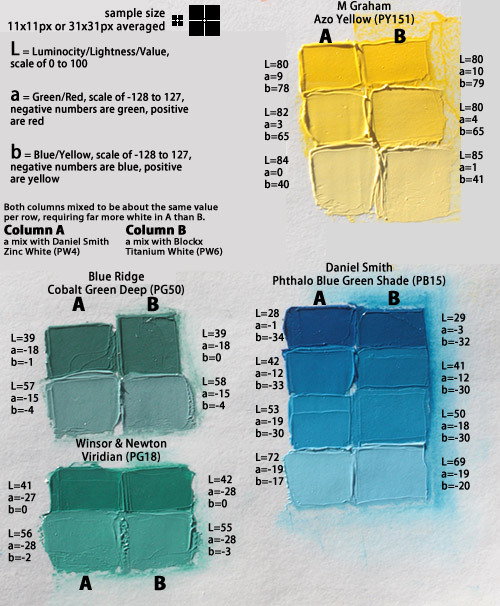 My own collection was a little sparse in green paints, so I got most of the single pigment ones Blue Ridge offers. I think the cobalt turquoise was just a little greener than the online swatch shows, but both that and the cobalt green light are very attractive paints. In fact the turquoise was among my top favorites of all the paints I got in this order. Cobalt green deep seems like the color of a dark pine forest to me. 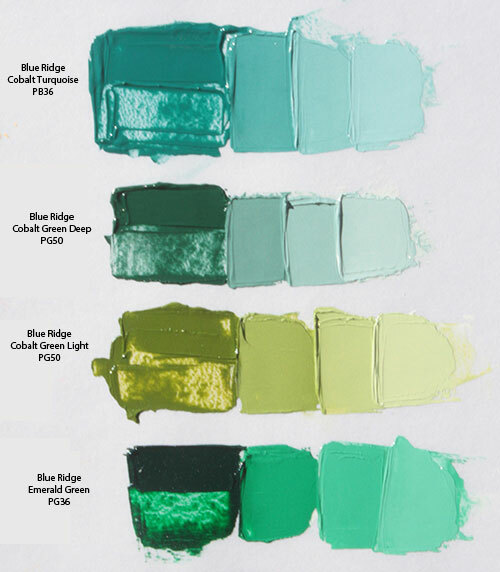 Emerald green is what many other brands call either phthalo green yellow shade or some unique name depending on the brand. Its masstone is darker than what is shown here and it’s very intense, just as a phthalo green should be. For some reason it has a strange very slight grainy texture to the paint. It doesn’t appear to affect its use any and I don’t feel any grit under the palette knife, but I just thought I’d mention it. I don’t have any of these from Winsor & Newton, but from what I’m seeing there’s a huge price difference between them and Blue Ridge. For example, Winsor & Newton’s cobalt turquoise retails for $59.99 for 37ml and even from a catalog is still $32.39 (on dickblick), while Blue Ridge’s version is only $20 for 40ml (more on that below under prices). It’s a transparent black with lighter masstone than any of the others I own. The tinting strength is very low, also more so than any other black I own. To me the tints are very neutral. I’m finding it to be one of my favorite black paint because it’s unique. It also has the same grainy texture as above, but again this doesn’t affect its performance. You can kind of see the faint and very thin lines of what I guess are pigment particles in the paint. I know it may seem odd to say this about a black paint of all things, but I just think this is the most attractive of all of these. So here’s my overall thoughts on Blue Ridge and my experiences. The box these paints arrived in was the most thoroughly packed box I have ever received from a catalog. Bubble wrap like crazy. As a result, everything was in essentially perfect condition. The only exception is that the tube of transparent red oxide had bit of an oil leak from the bottom, which only affected itself as no other tubes had oil on them thanks to the bubble wrap. I wiped it up and the leak has since stopped. While this is unfortunate when it happens it does happen, even to one of my recent tubes from Old Holland, and wasn’t a big deal. The mouths of the tubes are large, actually larger than I’d like, since I tend to be really stingy about how much paint I squeeze out and find it to be harder to do that with a larger mouth. It’s actually the exact same size as far as I can tell as what M Graham uses, and in fact the caps look identical except for M Graham being white and Blue Ridge being black. The labels all have a paint swatch of the actual paint that’s inside the tube which is very useful. I think I counted 70 paints currently on the site. That’s a good number for such a small company and I liked how many single pigment greens there were, but there’s some pigments I wish were included. Of course since this paint is all made by one guy there’s a limit to how many different things he has time for. I thought the purples/violets could use a couple of extra, since there’s only 4 of them total. There’s not a lot of violet pigments out there though, and even fewer are reliable, but maybe an ultramarine violet or manganese violet? The overwhelming majority of paints are made with very reliable pigments, with the obvious exception of alizarin crimson. 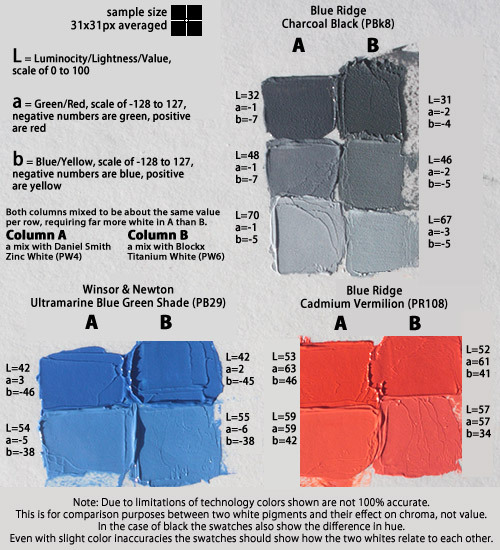 Currently I only know of one way to get paint from Blue Ridge, which is directly from their website. -Update- The paints used to also be available from Italian Art Store, but it looks like they’re not there anymore so I’ve removed the link and updated this text. I don’t think I can stress this part enough, the prices are really good. It’s like getting premium grade paint without the premium grade price. There’s something I noticed that may not seem like a big deal, but I appreciate it. The prices are all whole dollar amounts, except the cheapest tubes at $7.50. I hate the way nearly every business tacks things like *.95 to the end of every price, because you know they’re just trying to trick you into paying almost a dollar more without actually thinking about it because everyone focuses on the dollar amount instead of the change. Like I said it may not seem like a big deal, but I did notice and like the straightforwardness of the whole dollar amounts. All prices for the 40ml paints range from $7.50 to $21, except the genuine naples yellow which is $42. Very easy to use and I really liked the very large (and usually accurate) color swatches for every paint. Nearly all of them even come with short descriptions too that are actually useful and pretty much free from marketing language. My one minor annoyance was that when adding items to the cart each one takes you to the cart page and you have to click back to the product page after each item you add. Also I noticed a couple of typos, including apparently one in the price of cobalt turquoise which the site says is $19 but rang up as $20. Oddly, that same paint is one of the only price differences between Blue Ridge’s own site and italianartstore.com who lists it as $21. I’m not sure which is the correct one. -Update- The current site is a completely new one compared to what I had originally reviewed. It looks like the color swatches are different, but still large. Overall it looks good, but one downside of the change that I’ve noticed is that you have to click each paint and go to a separate page to see the price for it. I emailed him a couple of times with plenty of questions and he actually took the time, which he probably doesn’t have much of, to answer me. My impression is that he was friendly, candid, and trustable. Would I recommend Blue Ridge? I absolutely would. I’m very satisfied with every one of the paints I got, which I guess would make me 100% satisfied.